Made from 10 and 20 thou plastic card, strut and rod. What you are looking at here, dear reader, is the dawn of Russian aviation. Yakov Modestovich Gakkel was a teacher of the St Petersburg University, and became one of the founders of the St Petersburg's tram system and builder of the first Russian power lines across the Lena gold fields. 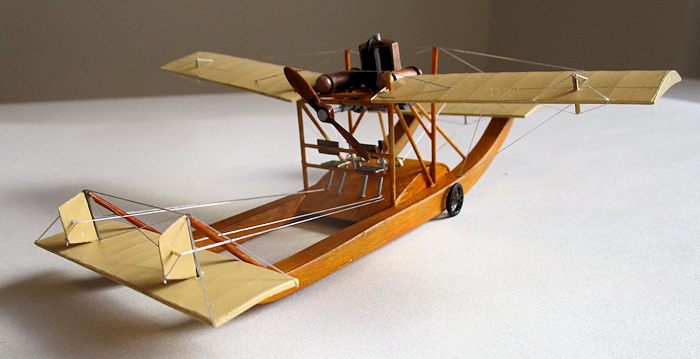 Like many engineers of the period, Gakkel was attracted to the fashionable hobby of flight. In 1909 he was a collaborator in the first Russian aeronautical company, established in St Petersburg. He was later joined by the renowned DP Grigorovich, after which they began to specialize in marine aircraft. The earliest flights in Russia were performed using French machines. But 19 June 1910 saw the first flight of the Gakkel III, a machine which was the first to be completely designed and built in Russia. Gakkel went on to design the first diesel locomotive engine for the USSR in 1922, and later entered the world of steam engines for tractors and boats. His son became a renowned oceanographer, and his daughter gained the first Russian professorship in a technological subject. Number 9, Moskovsky Avenue in St Petersburg bears a commemorative plaque to this great Russian pioneer. This aircraft, the slightly later Gakkel V, was an experimental amphibian two-seater, which was the very first Russian amphibious aircraft, and may well be the first in the whole world. It was constructed in Riga and exhibited at the St Petersburg International Aero Exhibition, in April 1911, and won a silver medal from the the Russian Technical Society for the original design of a maritime aeroplane. Power came from a Swiss Oerlikon horizontally opposed flat four engine. In some ways, the Gakkel V resembles those air boats which take tourists around the swamps of Florida and which proved so useful in evacuating the sick from hospitals in New Orleans when they were trapped by flooding after Hurricane Katrina. It is also surely a forerunner of the later Shavrov small utility amphibian which was widely used in the Soviet Union as a medevac aircraft. When contemplating a new scratch build, I usually spend a few dark hours ruminating on the plans and photographs in order to determine what the most difficult part of the build is likely to be. Complex canopies, compound fuselage curves, or hordes of rivets and louvres tend to darken my brow. This one however seemed to present no problems at all, and shouldn't be beyond the capabilities of anyone with limited scratch build abilities. It might even do as a starter kit for the man who wants to dip his toe in the water, or walk the high wire with no net, or take his first faltering footsteps, whichever metaphor you prefer. I can highly recommend scratch building. You have the satisfaction of knowing that your model may well be unique. And all your carefully acquired modelling skills on plastic kits will never go to waste. The two side-by-side floats are the most prominent feature of the design and so these came first. And they were simplicity itself. Just two banana-shaped pieces of card for the sides, filled in top and bottom with rectangular strips. Then came the sponson-like centre section, which looks like a blown up surf board section. Again, two fat aerofoil sides, and a length of card, top and bottom. This, together with the floats, was painted medium brown, and then dry brushed with a darker brown. Lifecolour Mid-Stone and Xtracour Dark Earth were on the labels, not that it matters very much. Any brown which you favour for doing wood will do. And a final coat of Vallejo Clear Orange, which happens to be flat, as I didn't want the glow you get with the Tamiya brand, which is gloss. The latter is also very sticky and tends to clump when applied. After that the wings were shaped from ten thou card for the lower surface and 5 thou for the upper surface, with ribs scored inside with a steel rule and dead biro. Both surfaces were taped around some dowel overnight to get the cam ber right. The canard surfaces and the tail can be made at the same time with the same method. Paint them your preferred linen colour. I use Vallejo buff, although many kit makers suggest other colours. Wingnuts suggest using Tamiya Deck Tan, but that looks a bit too grey to me. Likewise the Radome Tan which many modelers like, but which I prefer to reserve for that French inter-war caramel colour. To each his own, and there is never going to be any way of being definitive about historical colours. Even those ones which fall within the age of colour photography can never be exact, as film stock interprets colour in its own way, and degrades over time. What you call the exact shade of RLM Braunviolett is simply a matter of convention and agreement. Ideally one should first make up the internal ribs on these pioneer aircraft and then cover them with some sort of translucent material to represent doped linen. I am working up a cunning scheme on that score and will report back here at a later date. After that, all that was left was the central edifice, made from rod of various lengths and diameter. It isn't hard and the various bits and pieces are all in the plans. Before fixing the wings, you have the Oerlikon engine, which is basically four lengths of sprue for the cylinders and a rectangle for the crankcase. You can add spark plugs, wiring, exhausts and all the other engine paraphernalia to your taste. Then comes the furniture. A radiator was made up from some old mesh wrapped around two blocks of card, and then a surround of card, painted old copper or brass or something similar. Note that there is a clear gap down the centre of the radiator core, to let more air though. A simple hose from copper wire connects it to the engine. The two fuel tanks are sprue with rounded ends, painted copper, and tied down with some black thread. Note that the propeller shaft is quite long, and goes through a metal collar attached to one of the rear struts. It was at this point, slightly too late, that I now noticed the pilot's seats and equipment, which meant that it all had to be inserted into quite a tight area. There followed much wailing and gnashing of teeth. The seats are separate squabs of card, on four legs, and the back rests from curved card. Some leather paint covered them. Then two sticks with black grips, and then, most fiddly, two rudder bars, with four toe straps, all from card. There was no instrument panel, as it was all seat-of-pants stuff in those days. No doubt early Russian pilots considered the use of an airspeed indicator as unmanly, and beneath the notice of a gentleman. The only delicate part of the construction now arrives. Holes must be drilled through the wing roots and then slipped over the four vertical struts. Because the wings have a dihedral, these holes need to be very carefully measured and then drilled to ensure a tight fit, and good wing alignment. Take your time here, and the results will be satisfying. Try it too quickly and your chair will be surrounded by clumps of hair. There are no fins as such, just two rudders supported by struts. The two side wheels come from the invaluable Eduard etched spoke wheel set, with solder tires. When fixing the canard elevator, note that it is hinged along the leading edge. A couple of silver rods for this make a nice finishing touch. Then you will hear a drum roll for it is time for the rigging. It is not a biplane so it couldn't be easier. Just the usual elastic thread, coloured silver with a gel pen, and fixed using small drops of superglue applied with a sharpened toothpick. For the control lines, note that the two lines for the canard surface are off-set slightly to starboard. And also note that the rudder wires both disappear inside the central sponson, at a point just outside of each seat. Finally a propeller from the Big Bag of Dead Props, painted wood, and set at ten to four. There you have it, the first amphibian built in Russia, and quite possibly the first in the world, as I cannot find records of any before 1911. As I said above, Gakkel's mark III aircraft was recognised by the All Russian Aero-Club as the first aeroplane of completely Russian design to fly, at Gatchina airfield on May 24, 1910. Unbeknownst to anyone involved at the time, he was beaten by one day, by the equally famous pioneer aviator Kudeshev flying his own design, miles away in Kiev. So that is now an aircraft that I am planning for the future. Watch this airspace.